Firstly Ronnie Brown is Mr Wildcat. He is the man any team wanting to use the wildcat should want on their team. In Miami he burst onto the national seen breaking out huge plays under Steve Spagnuolo. With such experience at the role, the Chargers would be foolish not too even try snapping it straight to Brown on the odd occasion. Those last two words 'odd occasion' lead me onto my second point. The Chargers will no be using the wildcat more than 3 or 4 times a game. With Phillip Rivers under centre there is no way the Chargers will over use the option as they already have an electric passing offense which can change the game in a matter of seconds. The Chargers will use it as a change up to keep the oppositions' defence on their toes. It will give defencive coordinators an extra thing to think about when planning on how to stop the likes of Phillip Rivers and Ryan Mathews. The wildcat is a play which can produce really great plays. As you can see by Ronnie Browns 2008 wildcat highlights ( http://www.youtube.com/watch?v=EYEmxO1xzF0 ) it is dangerous play for defences as you can handoff, rush or pass or even a mixture, this produced touchdown after touchdown for the Dolphins in 2008. If the Chargers can add just a little of the productivity Miami had out of the Wildcat in 2008 then they will be an even more feared offense to play against this year. Another factor is the Chargers have plenty of play makers to go alongside Brown in the Wildcat. The likes of Ryan Mathews, Robert Meacham and Eddie Royal all gave the wildcat a go in OTAs. If Mathews in particular can grasp the art of the wildcat then it will be an extremely dangerous play. This was shown in Miami where Ricky Williams worked alongside Ronnie Brown. With this variety of electric athletes the Chargers are sure to find at least one player capable of playing alongside Brown. Overall the wildcat is a very interesting option for the Chargers. It is true that Ronnie Brown has not shown the same form he did in 2008, however given the chance he will be able to make a few plays in his special role. The wildcat will provide opposing coaches with lots to think about and add an extra dimension to the offense and hopefully provide some amazing plays similar to those on the above link. Hmm Chargers and "Wildcat"...interesting thought. Well as some kind of "backup plan" or Plan B why not? With that 2012 roster the Chargers got many options, indeed. But however most people don´t see us in the playoffs - we´re the underdogs. And I´ve to say I like that role. 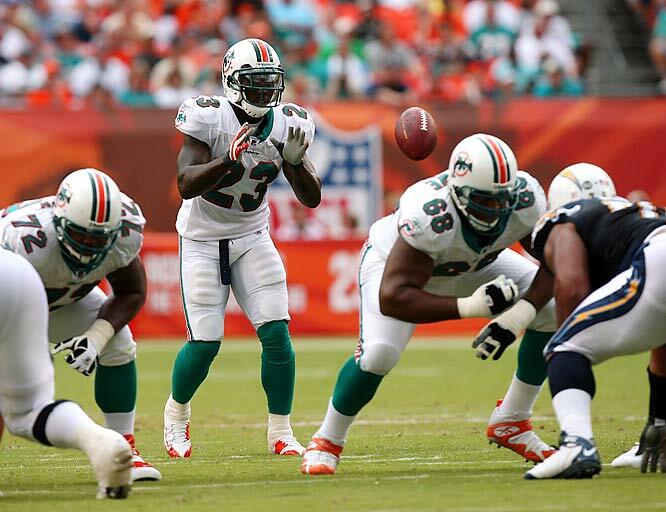 But it will definitely be interesting what Ronnie Brown can do 2012 and what his role will be. It´s always great to have many options and "wildcat" with Brown is definitely one - if we´ll see it on the field 2012...I don´t know, but it´s nice to know that they got that option.